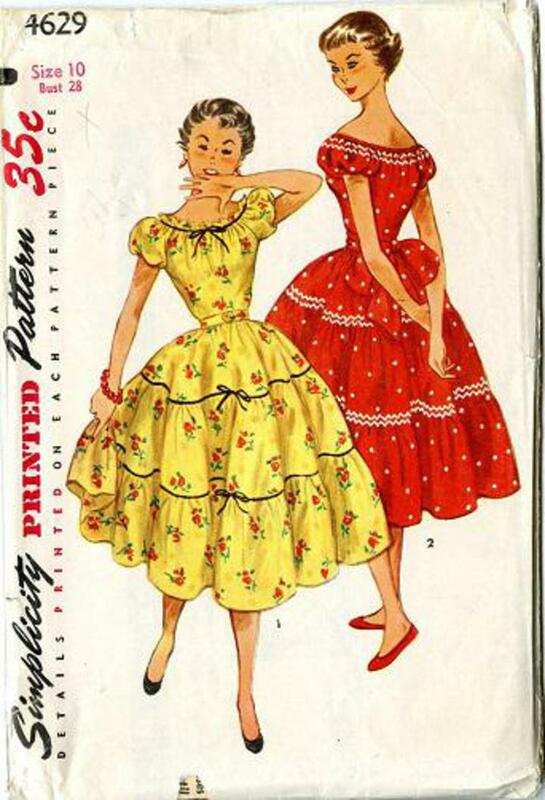 1954 Simplicity #4629 vintage sewing pattern, teen girl's party or dance dress, size 10. Bodice has a low rounded neckline, short puffed sleeves, gathered neck edge and elastic casing at lower sleeve edges. Skirt is gathered and cut in three tiers. Velvet ribbon and bows trim V. 1 skirt seams and neckline. V. 2 has rick-rack trim at neckline and skirt seams. Upper edge of sleeve is gathered with elastic. May be worn off shoulder.